BSN N.O.-XPLODE version 3.0 is the latest pre-workout igniter designed to deliver explosive energy and improved endurance. For normal energy-yielding metabolism BSN have included Vitamins C, B1, B6, B12 and magnesium into their new formula. 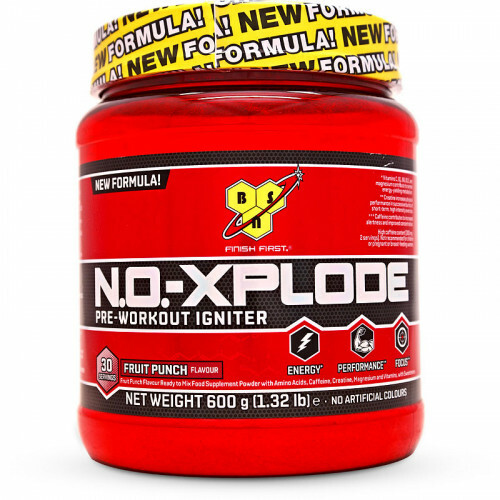 N.O.-XPLODE contains 150 mg of caffeine per serving which increases alertness and improved concentration preventing any distractions while you punish the iron. No pre-workout product is complete without Creatine which boosts physical performance during high intensity and improves recovery times. BSN has added this trusted ingredient to help you get the most out of your workout sessions. All these key ingredients are delivered in a product that tastes great, mixes easily and contains no artificial colours. Amino Acids [L-Arginine, L-Lysine Hydrochloride, L-Glycine, N-Acetyl L-Tyrosine, Taurine, L-Phenylalanine], Acidity Regulators [Citric Acid, Malic Acid, Sodium Bicarbonate, Tartaric Acid, Potassium Bicarbonate], Flavouring, Creatine Monohydrate, Beta-Alanine as Carnosyn®, Inositol, Betaine, Choline Bitartrate, Colour [Beetroot Red], Stabilizers [Dicalcium Phosphate, Disodium Phosphate], Magnesium Oxide, Caffeine, Anti-Caking Agent [Silicon Dioxide], Vitamins [L-Ascorbic Acid, Calcium D-Pantothenate, Nicotinamide, Thiamin Hydrochloride, Pyridoxine Hydrochloride, Pteroylmonoglutamic Acid, Cyanocobalamin, Cholecalciferol], Grapefruit Bioflavonoid Complex, Sweeteners [Sucralose, Acesulfame K], Grapeseed Extract [Vitis vinifera, seed], Capros® Indian Gooseberry Extract [Phyllanthus emblica, fruit], Black Pepper Extract [Piper nigrum, fruit]. Allergen Warning: Manufactured on equipment which processes products containing Soy, Milk, Nuts, Peanuts, Egg and Gluten. • Mix 1 level scoop [20g] with 250ml of cold water and consume 20-30 minutes before training. • Stir, DO NOT SHAKE. • Recommended daily consumption up to 2 servings per day. N.O. XPLODE is to be used within the framework of a varied and balanced diet and a healthy lifestyle. Food supplements are not to be used as a substitute for a varied diet. Do not exceed recommended daily dose. Keep out of reach of children.